Why is dynamic endpoint binding needed? Sometimes a BPEL process instance has to determine at run-time which implementation of a web service interface is to be called. We’ll show you how to achieve that using dynamic endpoint binding. There are three different implementations of the GetAvailableCars service. But how can we achieve calling them dynamically at run-time using Oracle SOA Suite? We need to allocate a concrete implementation of the GetAvailableCars service to the composite when deploying it. We could use the implementation of any of the location specific services (e.g. the Berlin service) but that is generally not a good idea as once the particular service is unavailable the composite can no longer be deployed. 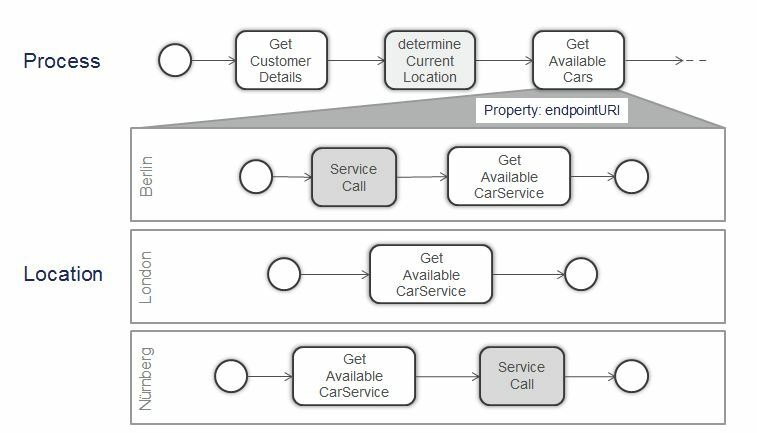 The mocked GetAvailableCars process is just there for decoupling a certain location from the caller during deployment time. During run-time the mock will not be called but replaced with one of the services configured in the DVM. However, if the dynamic call fails the mocked GetAvailableCars process returns an appropriate error message. Thereby we don’t have any dependencies on location specific services while deploying the composite. At run-time, however, the endpointURI property will override the deployed settings. For the sake of completeness we must not forget that the dynamic call as described here (using Oracle SOA Suite only) could also be achieved using the Oracle Service Bus (OSB) and its Dynamic Routing component. In scenarios where no service bus is available, however, our approach is certainly worth consideration.